It’s okay to wear burger after Labor Day, right? How was your long weekend? Did you do anything laborious? Or was it more like Non-Labor Day weekend? I’m hoping my true labor day comes in mid-January. I don’t think I ever told you my due date, have I? Technically, it’s January 26th, but with twins, probably like five minutes from now. But that would be horrible, so I’m going to backspace that sentence right now. In my miiiiieeeeeeennnnndddd. ANYWAY. Ours was pretty fab. I successfully didn’t fall off the stool whilst singing in the wedding. I had the guitar positioned in my lap in a way that it was tilted to the right because my belly was all, “nu uh, dude.” I looked hilarious and awkward, but whatever. And then we got back last night and we watched like six hours of American Ninja Warrior. I am OBSESSED with that show. Probably because it has the word ninja in it. But it’s like a cray version of Double Dare and I can’t even deal. I get so sweaty and anxious watching each contestant make their way through the obstacle course. And of course you’re so attached to each person because of the character building profile piece they do right before they compete. WE CARE FOR THESE NINJAS. And when they don’t make it . . . when they fall into the firey flames of the bottomless abyss (or water), you can’t help but fall with them. You wanted them to succeed. Now their two-year old in the audience will shun them forever, LOSER. My point is, burger looks incredible on you after Labor Day. Especially covered in a simple yogurt tzatziki sauce, olive tapenade, fresh mint and cool cucumber. And crumbled feta. And garden tomato. Should I warn you now that Edition 2 of “Thoughts on This Whole Being Knocked Up Business” is coming shortly? You know, that way you can go ahead and iron your straight jacket. Your due date is my birthday! Best day ever to have a baby or babies in my humble opinion ;) Glad your labor day was unlaborious - how it should be! Well now, I'm a January baby myself! How cool! And these burgers look great! At ETSY, you must check out the "Ninja In Training" Maternity T-shirt at CrazyDogT-Shirts. Hilarious! (My husband is the voice of Xever/Fishface for the Teenage Mutant Ninja Turtles cartoons, so I had to have one. (Insert eye-roll here)) Thanks for the turkey burger recipe!! I have been looking for a new one! Ah these burgers are awesome and I'd eat them any time any day!! Mmmmmm, my kind of burgers for sure!! My son is obsessed with the Ninja show, too, so we've had it on a TON in our house lately. I doubt in your state that you're building your own mini-Ninja challenges in your TV room (my son's favorite activity), but if you are, I won't judge. At the very least, you're giving the little ones something to aspire to when they're bigger. :) Yummy-looking burgers, too! 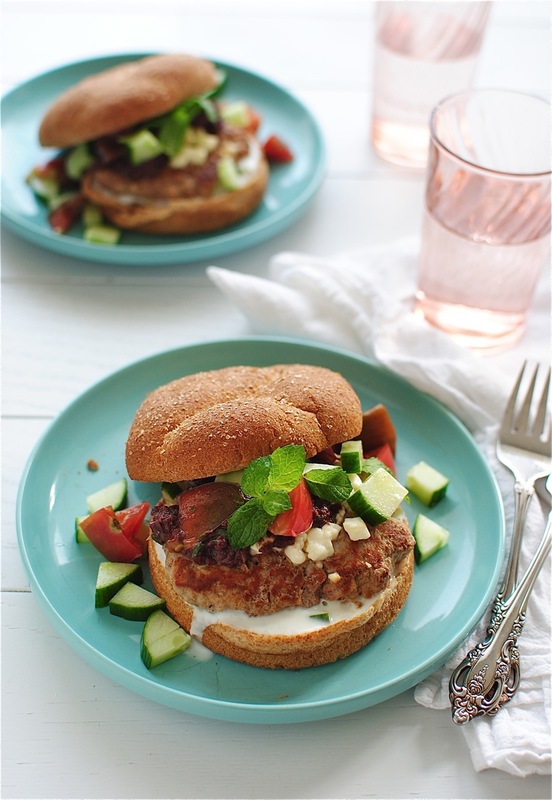 Good grief that is one mouthwatering turkey burger! Me want! "In my miiiieeeennnnndddd" <--- why I heart you. This burger looks very delicious. I think that turkey suits perfectly for a burger. As for me, I prefer to add more cheese into this burger and a bit of onions. It makes the burger more fresh and nutritious.